Featured-packed for the whole family. Relax or train in your own backyard 365 days per year. 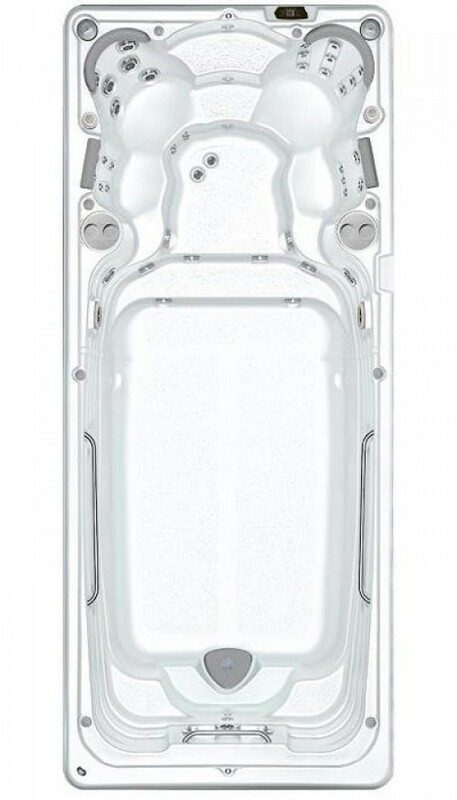 The Self Cleaning 19 fX Swim Spa is again, a fiberglass reinforced acrylic one piece mini-pool with dual zones that deliver the most flexibility, fun and benefits for the whole family. The Self Cleaning fX has all the exercise features of the Self Cleaning iX and more, with a variable resistant swim current, thigh/abductor jets for lower body massage and resistance exercises along with four full body massage hydrotherapy seats plus a featured waterfall neck pillow. The Self Cleaning AquaTrainer fX is a family pool, spa and aquatic gym all-in-one providing a great training center for the individual athlete who still wants to stay in touch with their family. A Hydropool AquaTrainer fX has everything your backyard exercise and entertainment center needs.